An aircraft of Russian airline delivered 18 metric tons of UN humanitarian aid to the Syrian city of Deir ez-Zor besieged by Daesh militants, the Russian center for Syrian reconciliation at the Hmeimim airbase said in a statement Tuesday. MOSCOW (Sputnik) — Russia delivered another 21-tonnes-cargo with aid, including flour, food packages and sweets for children, to a camp for internally displaced people near Masyaf city in the Syrian western Hama province over 24 hours, the military added. "An aircraft of Russian airline parachuted UN humanitarian aid, food packages and grain, of 18.3 tonnes in total weight, to Deir ez-Zor besieged by IS [Daesh] terrorists," the statement said. 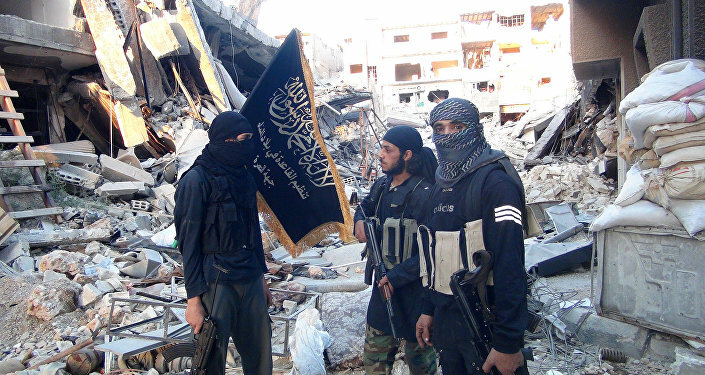 Deir ez-Zor, a major Syrian eastern city with population of over 200,000 people, has been besieged by al-Nusra Front and Daesh, extremist groups outlawed in Russia, since March 2014.